(Clockwise from top left) Cocktail Parlor in the new Horton Hotel; The Horton Hotel; The Lovins and their team. The High Country is about to get even more hospitable, when Boone’s first boutique accommodation and rooftop lounge, The Horton Hotel, opens later this summer. Envisioned as a place where both locals and visitors can commingle comfortably, the hotel brings new life to the historic Horton building on King Street in downtown. Built in 1929 by Henry Walter Horton, the original one-story edifice was a Studebaker dealership before it was replaced with a five-story department store and apartment building. Now owned by Fulton and Denise Lovin, founders of Boone’s White Fence Farm event venue, The Horton Hotel emphasizes local. “From coffee to craft cocktails, we work with local products and vendors,” says Denise. “We’re also working to partner with businesses to offer guests local experiences,” including tour packages, outdoor adventures, and yoga sessions. The Lovins aren’t the only people thrilled about the venture. 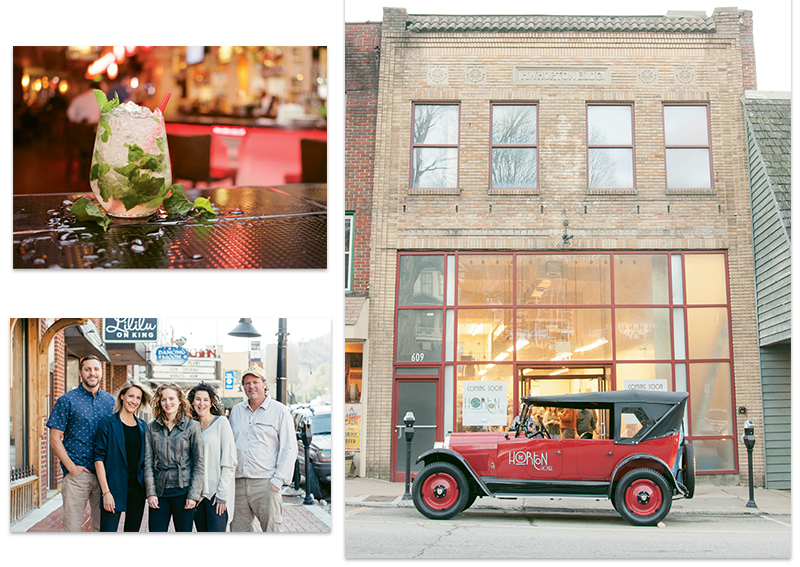 “Having a boutique hotel right in the heart of our downtown will spur economic growth while also offering visitors to our area the unique opportunity to eat, drink, shop, and stay,” says Brittney Clark, Boone’s downtown development coordinator. The Horton’s more than 12,000 square feet encompasses five floors (one of which is dog-friendly), 15 guest rooms, a cocktail parlor, and rooftop lounge. In addition to lodging and recreational space, guests can look forward to enjoying small plates, as well as craft libations, local beers, and small-batch wines—all ideal for raising a glass to this original High Country newcomer.